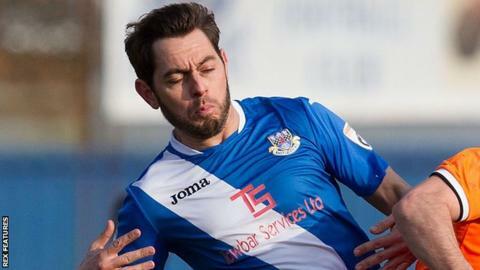 Eastleigh moved to within two points of the National League play-off places as they won at relegation-threatened Torquay United. Lee Cook's fourth-minute shot from the right-hand side of the penalty box was enough to separate the sides. Brendan Moore denied Cook a second in the first half while Angus MacDonald twice went close for the Gulls. Torquay, who had been on an eight-game unbeaten run, have now lost two in a row and are two points from safety. They have scored just one goal in their last six games and dropped to third from bottom of the table after Boreham Wood's 3-0 win over Dover. Match ends, Torquay United 0, Eastleigh 1. Second Half ends, Torquay United 0, Eastleigh 1. Attempt saved. Jai Reason (Eastleigh) right footed shot from the centre of the box is saved. Matt Tubbs (Eastleigh) is shown the yellow card for a bad foul. Ross Flitney (Eastleigh) is shown the yellow card. Attempt missed. Danny Racchi (Torquay United) right footed shot from outside the box is too high. Attempt missed. James Constable (Eastleigh) right footed shot from outside the box is too high. Attempt saved. Angus MacDonald (Torquay United) right footed shot from outside the box is saved. Substitution, Torquay United. Toby Ajala replaces Courtney Richards. Luke Coulson (Eastleigh) is shown the yellow card. Ben Gerring (Torquay United) is shown the yellow card for a bad foul. Foul by Ben Gerring (Torquay United). Substitution, Eastleigh. Matt Tubbs replaces Lee Cook. Substitution, Torquay United. Iffy Allen replaces Sam Chaney. Substitution, Torquay United. Luke Young replaces Josh Rees. Foul by Sam Chaney (Torquay United). Attempt blocked. Josh Rees (Torquay United) right footed shot from outside the box is blocked.